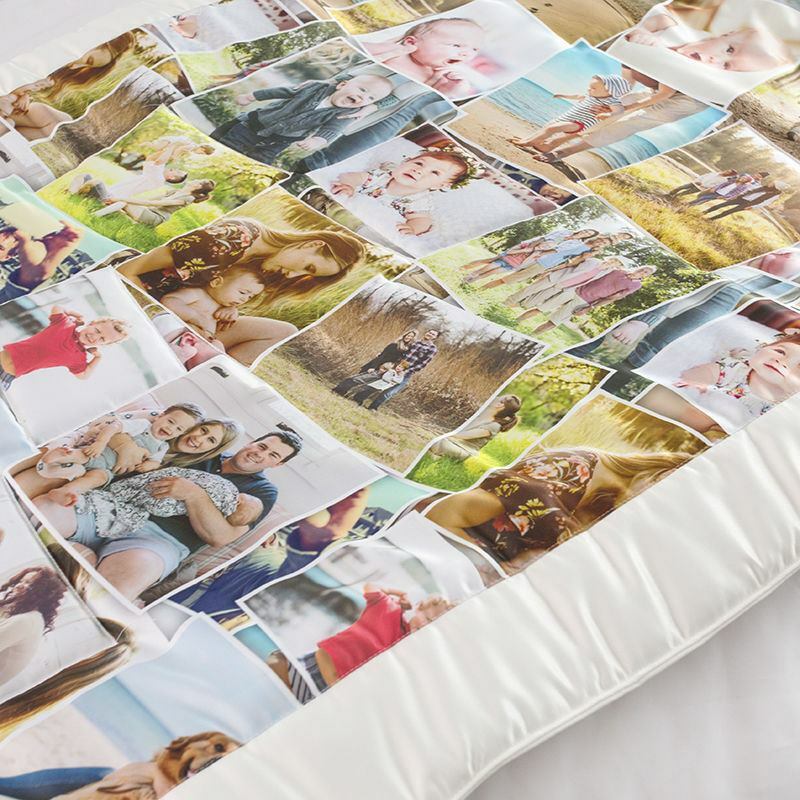 Not only are your personalised photo quilts an extra layer of warmth, but they're a stunning decorative piece for the bedroom. Made from thick, sumptuous padding covered in luxury Duchess satin, and presented in a satin storage bag, it's an elegant and classic gift. Choose from seven sizes and three colour options for the back. Printed with your photos in a patchwork style or just printed all over with your designs, they breathe a new lease of life into your bedding. Made from luxury Duchess satin with soft, sumptuous padding inside, they are expertly hand-sewn together to create an elegant personalised gift. Trust our 13+ years of experience to preserve your favourite photos in this quilt for life. Oh my goodness I was so impressed with the personalised quilt I designed. I ordered it on a Wednesday around 12pm and arrived on Friday morning. It was a 25th wedding anniversary present for my parents and I included lots of family images, young and old. The quality of the pictures and writing on the quilt came out amazing I was honestly so impressed. I went for the cot size so that it can be placed at the bottom of a double bed and cost me £107 including postage. I used the 'chat now' button when I had a query on the website and the staff where more than helpful. I cannot recommend this website enough, and my parents loved it. Thank you so much! Loved it! It's a memory keepsake, it's better than we imagined. Thank you. I was looking for some printing to be done on fabric for a quilt i was making and had a lovely reply from customer service telling me that this could be done. i then went onto your website and tried to make the order and was a bit confused but one of your chat people pointed me in the right direction and it was quite simple once i understood what i was doing. The items came very quickly and i was really pleased with the quality of the prints. I would recommend this company they were extremely helpful as I am someone who is not very computer literate and if I found ordering easy, then then they must be good!! Excellaent service.Delivered on time. We were very Pleased. Care: Dry clean only. Do not put in washing machine or tumble dryer. Surface wash with mild soapy water and a soft sponge. Follow these care instructions and your satin photo quilts will last a lifetime. If you'd love your very own patchwork style quilt but don't have to time or materials to make one, design your own here for a quicker, easier and modern alternative. You can print a photo collage to look like pictures sewn together, or keep it classic with squares featuring a different pattern in a mismatch order. Create a gorgeous satin quilt in the cot size for your baby's Christening. This can be the blanket you hold them in whilst they're receiving the blessing. Not only is going to look great in all the pictures but it doubles up as a sentimental keepsake. When your children grow up, you can pass their photo quilts onto them to pass down to their babies. Get your photos together from all the best holidays away and make a novel memory quilt. As you snuggle up in bed or on the couch, you can reminisce of places far away, and it might inspire you to start planning your next adventure. We discovered from our customers that this product has been a great help and comfort to families with family members having dementia, because the memories, printed as larger scale photos, help prompt them to recall events and family members. These precious heirloom quilts are so amazing and superior in quality. Not only can they portray the family, like a family tree quilt, but they are also perfect for handing down the family. The long-lasting print and exceptional construction mean they can last for generations. Click start design and begin creating your modern alternative to a personalised patchwork quilt. Personalised photo quilts are handmade to order in London, UK, by our expert seamstresses. We use a specialist printing process that fuses the ink to the satin fibres, so your designs won't scratch off or peel away. The print is striking, with an almost HD finish. We print your designs onto a piece of Duchess satin fabric, and print another piece with your chosen backing colour. Thick, sumptuous padding is inserted before the two pieces are hand sewn together with mitred corners (to create the border), so your photo quilts are a real example of artisan craftsmanship. The colour that you choose for the back of your photo patchwork quilt will also be used for the border on the front. Choose from lilac, ivory or pink, selecting the best colour to complement your design. The border is a classic design feature of a patchwork photo quilt and gives your quilt a homemade charm. To recreate the look of a patchwork quilt, choose to make a photo collage where you can print loads of your favourite snaps. It's a contemporary alternative to traditional patchwork style blankets. Simply upload your photos and select more than one in the design interface. Here you'll be able to choose from ready-made montage styles or rearrange the photos manually to create your own.